The Amsoil Championship Snocross series dropped green in front of a packed house at Canterbury Park in Shakopee, Minn. for rounds 5 and 6 of the national snocross tour. Carlson Motorsports Pro-Lite riders Andrew Carlson and Ryan Springer were back to their championship chase form after the holiday break with dominating qualifying efforts and a dramatic charge-from-the-back podium finish. After both riders won their opening round of heat races on Friday, both experienced the unpredictability of the wide and fast Canterbury track the following round. Carlson was ejected from his Polaris while bombing the backside rhythm section, while Springer was tossed after another rider made contact in the chaos immediately following the start. Carlson quickly remounted and gained enough points to go directly to the main event, while Springer went on to win the Last Chance Qualifier. In the main event it was Springer who shocked much of the field as he blasted from the back row and emerged in fifth mid-way through the opening lap. From there the Pro-Lite class lived up to its reputation of being the most tightly contested and competitive division in national competition. Springer battled briefly with teammate Carlson (who eventually finished fifth), before sneaking by using his bull-rush style to his advantage as he battled heavy snowdust and traffic. With laps winding down, Springer found himself in second place, but simply ran out of laps to make a meaningful push for the lead. Saturday was more of the same for Carlson Motorsports athletes as they leveraged the strength of their Polaris sleds to top of the pack holeshots in qualifying. Both easily made the front row of the final with Andrew going 2-1 and Springer 1-1. 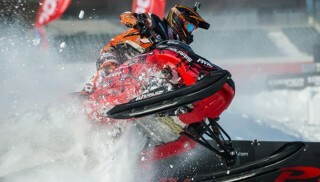 In the main event, both riders ran strong, battling heavy snowdust and plenty of on-track chaos as downed sleds and ever changing track conditions made it difficult to develop a rhythm for either rider. At the flag Carlson just missed the podium in fourth and Springer was close behind in sixth. The parity of the Pro-Lite ranks is evident in how tightly packed the points standings are after six rounds. A mere 25 points separate the top six riders and both Carlson and Springer are in the mix and gaining ground. Carlson sits third, just 16 points out of first, and Springer is in sixth, 25 points out of the lead.